The author is Jeff L., which I guess means that he is only half an "anonymous coward" by Anthony's standards and is therefore half okay. The half that Anthony is okay with, when it comes to Anonymous Cowards. The Anonymous half. Jeff wrote about how he went about estimating what he thought was the equilibrium climate sensitivity (ECS). It wasn't. He was estimating transient climate response. sensitivity parameter (units: °C (W m–2)–1) refers to the equilibrium change in the annual global mean surface temperature following a unit change in radiative forcing. The effective climate sensitivity (units: °C) is an estimate of the global mean surface temperature response to doubled carbon dioxide concentration that is evaluated from model output or observations for evolving nonequilibrium conditions. It is a measure of the strengths of the climate feedbacks at a particular time and may vary with forcing history and climate state, and therefore may differ from equilibrium climate sensitivity. The transient climate response (units: °C) is the change in the global mean surface temperature, averaged over a 20-year period, centred at the time of atmospheric carbon dioxide doubling, in a climate model simulation in which CO2 increases at 1% yr–1. It is a measure of the strength and rapidity of the surface temperature response to greenhouse gas forcing. Jeff claimed he came up with a number that was less than the IPCC estimate. He didn't. His number was slap bang in the middle of the IPCC estimate. What Jeff L. did was take the HadCRUT4 surface temperature anomaly and the CO2 record. He spliced the Law Dome CO2 measures to the Mauna Loa record to get a series back to 1850. Based on the above and, after discussing and doing some "goodness of fit" calculations on each of the "ECS" plots, Jeff settled on what he called an "ECS" of 1.8°C. However there are a few wrinkles. Most of these will be obvious to the reader. Firstly, Jeff L. isn't calculating equilibrium climate sensitivity because he hasn't allowed time for the earth system to reach equilibrium. Not even short term equilibrium. He is attempting to calculate the transient climate response. The surface temperature at the time of CO2 doubling. To my way of thinking that's the biggest thing wrong with what he's written. As a rough estimate and making assumptions that other forcing are negligible, you could argue that it's okay. Especially when you compare it to other estimates - it's in the ball park. Other forcings in the first half of the twentieth century aren't negligible though, particularly the rise in solar radiation and pollution. And it's likely that some forcings in more recent years aren't negligible either. I'm thinking about the drop in solar radiation and pollution (aerosol forcing). But as long as you aren't wanting any more than a rough estimate, it's okay. So, despite what Jeff claims to the contrary (see below), Jeff's number is slap bang in the middle of the IPCC estimate. If you read his article, you'll see he's made other assumptions as well as misrepresented the IPCC report. 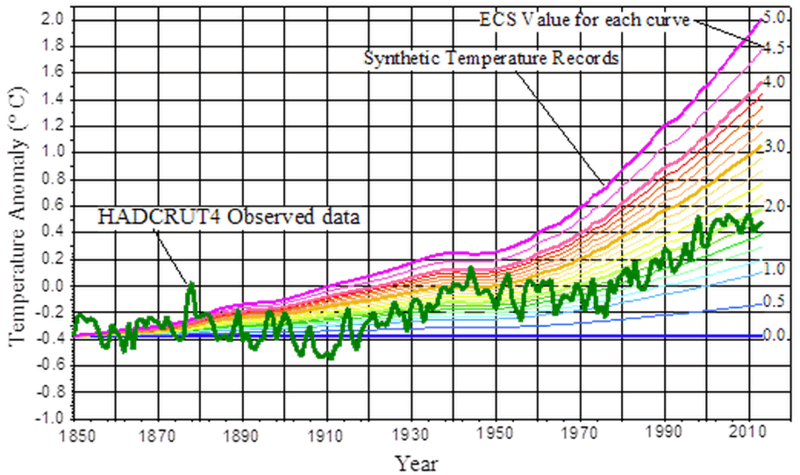 For example, Jeff reported that the AR5 report estimated ECS as 3.4°C. In fact the IPCC estimate is that ECS is "likely" between 1.5°C and 4.5°C, while not giving a "best estimate", unlike previous reports. But as I've just said, Jeff didn't work out the ECS. He worked out the transient climate response and got an estimate in the middle of the IPCC estimate. All potential “catastrophic” consequences are based on one key assumption: High ECS (generally > 3.0 ° C/ doubling of CO2). Without high sensitivity, there will not be large temperature changes and there will not be catastrophic consequences. As such, this is essentially the crux of the argument : if sensitivity is not high, all the “catastrophic” and destructive effects hypothesized will not happen. One could argue this makes ECS the most fundamental quantity to be understood. Jeff is wrong in a number of ways. For one thing, the consequences depend on the amount of emissions as well as on climate sensitivity. If sensitivity were, say, 2°C but we ended up with four times the amount of pre-industrial atmospheric CO2, then temperatures would rise by 4°C. This would have very big consequences and is a huge risk to take. If sensitivity were 4°C and we quadrupled CO2, then we'd be looking at a rise of 8°C. That would render a lot of currently inhabited land uninhabitable. Thing is, for safety's sake we've got to keep total emissions under 1,000 gigatonnes of carbon. We're almost halfway there already and annual emissions are increasing each year. Some people argue that 1,000 gigatonnes will take us above the safe level. Furthermore and most importantly, any policy changes designed to curb “climate change” are also unsupportable based on the data. 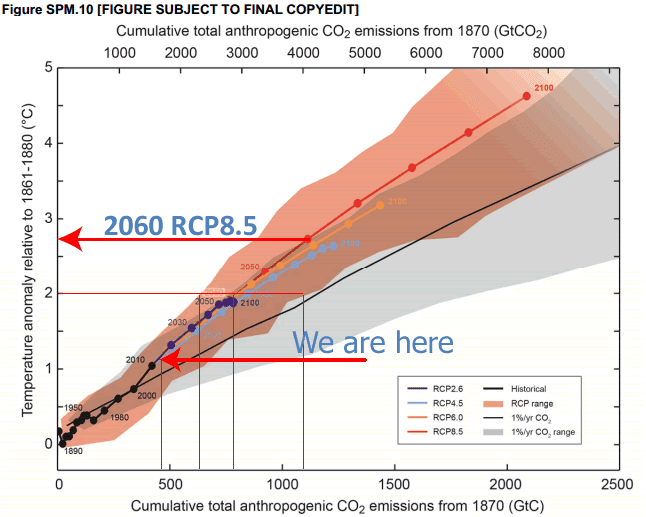 It is assumed that the need for these policies is because of potential future catastrophic effects of CO2 but that is predicated on the high ECS values of the IPCC. Most deniers don't want to shift to clean energy. Whether it's because they fear change or because they know it requires actions by governments and changes in some industries it all boils down to the same thing. They just don't want change and will fudge and misrepresent evidence and reject science to try to justify their stance. Jeff is right and has proved we don't have to cut CO2 emissions and that climate science is a giant hoax committed on we, the sheeple, by greenie, nazi, Lysenkoist, commie, warmist, alarmist, eco-tard, cultist, watermelons. So there. Okay, I threw in the last one myself :) It's the sort of thing you'll read any day of the week on denier blogs. Here is a sample of comments from the archived article. Continuing from my comment at 2:16pm, the inevitable conclusion is that it is not greenhouse gases that are raising the surface temperature by 33 degrees or whatever, but the fact that the thermal profile is already established by the force of gravity acting at the molecular level on all solids, liquids and gases. So the “lapse rate” is already there, and indeed we see it in the atmospheres of other planets as well, even where no significant solar radiation penetrates. The simple fact is this; warmists believe that traces of CO2 generated at ground level by the burning of so called “fossil fuels” make the implausible journey to the upper atmosphere and cause CAGW – they have NO other position whatsoever, and since despite their mantra and models, recent GW has ceased for 17.5 years, they have NO position whatsoever. Case proven and closed, time to get a real job and stop wasting the taxpayers money! I always suspect calculations based on 100 plus years which eliminates the historical earth climate. Other warm periods in time plus the various ice ages. However I do understand in the AGW camp CO2 as THE factor. What I don’t get is why we always fall into the AGW trap and only concentrate what the AGW camp wants us to talk about, CO2. Something melted each ice age long before man ever existed. I know, I know – trying to prove man is entirely responsible is the buzz words. With respect – I don’t trust any temperature massaged so many times none of us know what real temperature were or supposed to be anymore. Even the different data collected by different device cannot agree with each other and have to be massaged. Here’s Siple vs Mauna Loa. I wouldn’t be surprised if Law Dome has also been faked. The article ignors the fact that CO2 changes are a result of warming rather than a cause. The most significant evidence we have of low sensitivity is the pause. The alarmist need the heat to be in the ocean. They need it or they know it is game over. If we have perfect measurements from satellites of the input and output heat radiation budget then we will know if heat is in ocean. My guess is that there is a big negative feedback mechanism we do not fully understand. There is some type of release valve , throttle as Willis says. It has to do with water cycle or wind in my opinion. Thank you for your research and publication. I feel that if the HADCRUT, and other temperature records, including the satellite data, have been so grossly adjusted to reduce warming periods before CO2 started its rapid increase and to increase warming as the atmospheric CO2 levels increased, that they are false. This dishonest and criminal tampering with the data to suggest global warming that just never happened means that accurate and true measured temperature to compute global temperature simply do not exist. Thus, we have no measured data to compare with modeling results. Unless something like another little ice age (which I hope does not occur) cools to the extent that future data cannot be adjusted upward without it being obviously and criminally altered, then we are stuck with adjusted data. Yes, I think you're quite right. At best he's computing TCR not ECS as he doesn't realise that the temperature when CO2 has doubled is the TCR. The ECS is only reached later when the system has retained equilibrium. Since we're talking ECS and TCR, have you had a chance to look at Lewis (2013). The reason I ask is that having read it, it appears that when he uses his method and uses data up until 1995, his method gives an ECS of 2.0 - 3.6. When he adds six more years of data, it drops to 1.2 - 2.2. Personally, I would expect that to indicate some major issue with his method, or that he's also confused ECS and TCR (which is tricky to see as I think the ECS was built into the data). I just wondered if you'd given this any thought or heard anything. Anders, I have no expertise in Bayesian stats, which is what Lewis13 is based on. IIRC Lewis13 wasn't that different from Otto et al, which was published around the same time. They both got lower estimates when they included this century's data. I'm with you that if the bayesian results can change so much with just a few more years of data then that has to limit their predictive power. What happens when the surface temperature starts shooting up quickly again? I don't think we can totally disregard these studies but I do think one can't consider them on their own. There is paleoclimatology (which isn't as refined as the instrumental record) as well as what comes out of models. I reckon you have to look at the totality. There's a paper by Schmidt et al on comparing models with paleo reconstructions which I want to look at this weekend. At first glance it looks like that approach could have promise. Sou, thanks. I'm not that familiar with Bayesian stats either. I'm not convinced that the overlap with Otto is quite as good as you think. I think Otto's prime result was something like 1.3 - 3.9, so the lower end is lower than others, but the top end similar, and the mean/median was about 2. Lewis's final result was (I think) 1.0 - 2.2 with a mean/median of 1.6. So, that's quite different. The main issue I have is how much it changed by adding 6 years of data. I would argue that such a sensitivity to small increases in data would argue for probably disregarding his 1.0 - 2.2 result. Of course, it would be nice if one could show why there is an issue, but I don't really know how to do that. There's a recent Libardoni & Forest paper that might be suggesting that Lewis is wrong, but it's not explicit. Something that I hadn't realised is that they're only using the period 1946-1995 (which Lewis extends to 2001), so that would also be rather concerning. I'd somewhat missed the last sentence. I think he's been focusing on this one Employing the improved methodology, preferred 90% bounds of 1.2–2.2 K for ECS are then derived (mode and median 1.6 K). He argued to the Parliamentary committee, that the actual ECS is 60% lower than that from climate models (and, by inference, paleo estimates). I agree with why it gets publicity. I don't think it should be completely dismissed but I would be surprised if his results stand up to much scrutiny. The similarity with Otto was that both were estimates were lowered by the inclusion of recent observations. (In the case of Otto, the best estimate of TCR was lowered but the best estimate of ECS rose a tad.) It's a feature of the methodologies I presume. Lewis was based on Bayesian stats and Otto on an energy budget calculation. In neither case was the lowering a result of a change in physics or a different understanding of forcings AFAIK, they were both just based on inclusion of 21st century observations. I conclude that both methods would result in a raising of ECS and TCR once surface temps shoot up quickly again, like temps did in the 80s and 90s. I rarely disagree with you, but on this occasion I have to. I think that Lewis' result is deliberately biased low and I think Lewis is acting from ideological rather than objective motives. Witness his emergence from nowhere, the company he keeps and the statements he makes in public. Add in the incompatibility of his estimate with paleoclimate evidence and there is a strong argument for dismissing it entirely. I'd had the same reaction as ATTP when I heard about Lewis' paper. If your estimates change that much by adding another 10-20% of data, then your conclusions are very much *not* robust. Quite the opposite - I'm surprised he got published. You should probably bear in mind that I'm trying very hard to maintain some apparent scientific objectivity. I was also only referring to what he presented in his paper, and not what he has said publicly since. My gut feeling is that he hasn't deliberately made a mistake in his paper. However, his public pronouncements about his paper are extremely non-scientific. Rarely would a credible scientist completely dismiss all other evidence and suggest/claim that the only sensible method is his own and that - consequently - that the only reliable evidence is what he has presented. You should probably bear in mind that I'm trying very hard to maintain some apparent scientific objectivity. My gut feeling is that he hasn't deliberately made a mistake in his paper. Since I cannot seem to find any strong support for the idea that ECS can be estimated reliably from short periods of "observational" data, both Lewis' result and his subsequent monomania about it induce a powerfully sceptical reaction. Hence my view that Lewis is lacking in proper scientific objectivity. He sees what he wants to see, not what is. In general I think you have summed up the issue with Jeff L's essay well. It is showing TCR, not ECS, and the number he arrives at is not controversial. Further to this (and the discussion above about Lewis et al), the idea that anyone is "pinning down" a number is absurd, because it all depends very heavily on assumption about non-GHG forcings. And since we know very little about such, we end up with very wide error bars, and this allows anyone to choose a high or a low number for TCR on the basis of there ideological predilection. Certainly, fear of change is a very human response. However in this case I think you are indeed “jumping to wrong conclusions for all the wrong reasons.” If there is any opposition to “clean energy” (read: renewables), it comes from those quite rightly pointing out that it is expensive (and will not be accepted by the developing world, who will be responsible for most CO2 emissions in the next century), technically limited by intermittency and lack of affordable storage mechanisms, and shows not prospect being able to be deployed fast enough to make a difference (it is currently supplying less than 2% of the world's electricity (let alone energy). If by clean energy you include nuclear power, then opposition come more from an irrational fear of radiation exposure and general misinformation on the technology, than from fear of change alone. "Lewis et al", I mean "Lewis (2013)"
Greig, re renewables - they are the excuse often made by deniers, not the underlying reason for their opposition. Both excuses can easily be countered by facts. The underlying fear is of government intervention and fear of change. Renewables are associated with Greens, which makes them automatically bad in rightwing eys. However competitive they get rightwingers will still believe them to be expensive because they heard that somewhere once. Perhaps when they were young. Anyway, they just are, so there. By the same token, nuclear (seen as anathema to Greens) is cheap however much it costs. The power industry doesn't like the implications of renewables for the current market structure, which involves centralised, capital-intensive production distributed to users through a high-capacity (and capital-inensive) grid. Nuclear fits that structure and is welcomed. Renewables involve distributed production by relatively affordable units feeding local grids. Extreme weather is already demonstrating the advantages of the latter approach, and of course local solar is a big and growing thing in developing nations. On the prospect of renewable energy we are seeing all the same tactics used by so-called deniers Lots of wishful thinking and rationalising to reach a preconceived conclusion including conspiracy theories and mischaracterising the opposing view, and very little reference to science or expertise. This report suggests renewables deployed in way that would actually reduce emissions, would cost about 3 times what we currently pay for energy, and about twice the equivalent low emissions solution based on nuclear. that is completely unaffordable to Australians, let alone to a developing country. And this discussion demonstrates some of the engineering challenges in deploying low emissions solutions. The facts don't stack up for renewables. And it is a big hole in the argument for action on climate change that there isn't a pragmatic solution being presented. Jim: But that report doesn't consider nuclear power (fission). Most of what I've read and heard lately about cutting emissions admits that nuclear fission needs to be a big part of the answer for the next few decades. As does energy efficiency and R&D. A carbon tax would help the market reach such solutions. Even if renewable energy costs 3x current FF energy, it is a price the rich Western countries can afford (subsidizing the poor if necessary). Otherwise the argument is that our needs should come ahead of the next 4,000 generation's needs -- and who can seriously make that argument? We are already rich enough to make a serious attempt to cut carbon emissions. But we're not even trying. I forgot to post this site which links to studies that give costs to nuclear power. it is a price the rich Western countries can afford (subsidizing the poor if necessary). I think this may be at the heart of the issue. Few appear to be able to quantify the implications of paying 3 times what we pay now for energy (and goods and services) in a post GFC world. And the impact this would have on trade competiveness, jobs, health education, and prosperity. And it does not address the fact that global energy use is exploding and the developing world certainly is not rich enough to afford renewables. I would argue that nuclear is the only practical answer and needs to be a big part of the proposed solution if there is to be anything meaningful done. If the next 4,000 generations are at risk, the perceived dangers of nuclear must surely be irrelevant. Do you know the difference between wholesale and retail? Obviously not, because you have made this fundamental and critical error in your 'assumptions'. Blinded by ideology perhaps? The wholesale price of electricity is only about 24% of the retail price anyway. The report that you quoted absolutely and unequivocally DOES NOT say that renewables will cost 3 times what we currently pay for electricity. On table 14, it gives the projected impact on retail prices. (Retail prices are what we currently pay). If we could get our electricity at wholesale prices at 5c/kWh, well, we would all be dancing in the streets. On table 14, page 35, the projected impact on retail prices is between 6.6c/kWh and 8.5c/kWh. Considering the average price for retail electricity averaged across Australia is 29c/kWh, an increase of 6.6c/kWh is certainly not 3 times. So given that you can't do even the most basic math and don't know what clouds are made of, what is the point of you giving us your ridiculously flawed and ideologically driven analysis. Rather pointless really. Using the hypothetical capital costs presented above and making allowances for O&M, fuel and financing costs, AEMO estimated the hypothetical annualised costs for generation and storage required for each case, including network connection costs. Again, while these estimates are consistent with the study scope, they do not represent what costs might be in practice. To cover the hypothetical capital and operating cost of generation and storage plant and connections only, wholesale electricity prices in the range of $111/MWh (in Scenario 1 2030) to $133/MWh (in Scenario 2 2050) would be required. These costs are in 2012 dollars. For comparison, this component is over double the average 2012 wholesale electricity spot price of around $55/MWh. Currently many renewable generators receive financial support from outside the electricity market through schemes such as LRET, SRES and feed-in-tariffs. The costs of these schemes have not been estimated and are not included in this comparison. Additional investment required in new shared network transmission infrastructure would add another $6 to $10/MWh to the above estimates. The wholesale electricity price increase and the additional transmission prices would be passed on to consumers via retail prices. The relative impact of these price rises would depend on other retail price components, such as distribution prices, and would be greater for industrial and commercial customers for whom wholesale prices represent a greater proportion of the total retail cost. The projected wholesale prices include the impact of wholesale energy prices and transmission costs but do not include other possible factors such as distribution costs, land acquisition, stranded assets or any other government policy schemes. If these costs were included, retail prices would be likely to be higher. Obviously you can't read Dave, or you you deliberately obfuscating because this report is saying something you don't want to accept. You are acting like one of those so-called deniers. More tedious diversionary waffle. The problem is emissions. Your problem is denial. The policy response requires decarbonisation of the electricity supply (to start with) and that will require a large-scale build out of nuclear (monolithic and modular micro nukes) AND renewables. Engineering a low-carbon infrastructure is a wholistic process, not a selective one. Deniers who try to push renewables (or policy response in general) off the table are as stupidly misguided as anti-nuclear ideologues who think we can do this with renewables alone. All credible analyses show something like 30% nuclear and 30% renewables by 2050 if we go FLAT OUT starting now. The rest is still fossil fuels. Anyone trying to ditch a 30% reduction in FF dependence by mid-century on ideological grounds is a dangerous lunatic and needs to stop wittering and start thinking like a rational adult. We do not have the time or the leisure for this sort of fuckwittery any more. I can't believe that you are still quoting the wholesale price, and then accusing me of obfuscation. Oh, the irony. It is you who cannot accept reality. The rise in the RETAIL price was at most only 8.5c/kWh, a fraction of the about 29c/kWh that we pay now. Obviously it is you who cannot read, as you don't know the difference between wholesale and retail, kWh and MWh, and that it's the retail price that business and consumers pay. You have been caught with your pants down, AGAIN, and you will now try and squirm yourself out of this gargantuan and colossal mistake with never ending gish gallop and pedantic sematics. Just give up before you lose all sense of credibility. Getting nuclear to a 30% level would be quite ambitious. No one is willing to invest in such a backward technology. Already now one nuclear power plant explodes per decade. And it only provides a few percent of the electricity. If you would like to increase that by an order of magnitude, one nuclear plant will explode every year. How do you want to protect your modular micro nukes against terrorists? I would already be happy if the current nuclear power plants were protected against aircrafts flying into them. BBD, the EU target for 2030 is 27% renewables. In my estimate that is not a particularly ambitious target. There are several things we need to bear in mind here. First, I was talking about the global technology mix for electricity generation in 2050, not the European region. Second, projected global electricity demand is expected to rise considerably by 2050. Third, if you are correct and renewables do manage to take a larger share of the global technology mix then we will be closer to 100% global electricity generation without fossil fuels. But I know of no credible research that projects 100% world electricity supply from renewables by 2050. Nobody really wants nuclear, but nobody wants emissions either. Decarbonisation of the electricity supply by the fastest means is paramount, and that requires a holistic approach. We cannot afford to push nuclear off the table. If you would like to increase that by an order of magnitude, one nuclear plant will explode every year. You have used false equivalence to argue that modern Gen III+ reactors are as likely to suffer catastrophic failures as dangerous and obsolete reactors (Chernobyl; Fukushima). This is a logical fallacy. I would already be happy if the current nuclear power plants were protected against aircrafts flying into them. They are. There's reams written about it, but this will do as a start point. Micro nukes are extremely robust. As with large-scale reactors, the containment vessel would have to be breached, and that is going to provide terrorists with a technical challenge. Especially as the reactors can be buried underground to prevent lunatics damaging them. But of course there is risk. Climate change is risk. Intelligent design and deployment is essential. I think we can do this and I believe circumstances provide us with no real choice anyway. All credible analyses show something like 30% nuclear and 30% renewables by 2050 if we go FLAT OUT starting now. BBD, stop wasting time and reference your credible analysis of global energy technology mix, attaching to a suitable study. Otherwise you are just making assertions and expressing opinions that match with your predilections. Which is what your so-called denialists do, right? Victor, non-hydro renewables are currently 2% of global electricity generation. Getting to 30% by 2050 is very unlikely, and quoting EU political ambitions is not reality and not an accurate view of global growth prospects. Nuclear is already at 17% of the global mix. The new nuclear reactor designs are not "backward", you are obviously looking at old plants like Chernobyl, TMI and Fukushima which is 1950s tech. Dave, I'll try to keep it simple. Retail prices to specific consumers (which is what you are apparently referencing) are often deliberately skewed, and do not reflect the overall costs. Base wholesale price is directly linked to the costs, the most accurate indicator of overall impact of the high cost of renewables on the community. Read the references, they prove that you are wrong. This nuclear energy roadmap has been prepared jointly by the IEA and the OECD Nuclear Energy Agency (NEA). It finds that one quarter (24%) of global electricity could be generated from nuclear power by 2050, assuming no major technological breakthroughs. This would make nuclear the single largest source of electricity in 2050, with a correspondingly significant contribution to cutting greenhouse gas emissions. There's plenty more. Get off your arse and find it. Further BBD, I am not pushing renewables off the table. I am pointing out (with references) the limitations. If you don't do that, then you will get too much "we need 100% renewables now!" which isn't practical. The IPCC report is discussed here. The obvious flaw is the over-reliance on biomass potential, and near zero discussion about the environmental and economic drawbacks of large-scale moves to bioenergy. More than half of the scenarios show a contribution from RE in excess of a 17% share of primary energy supply in 2030 rising to more than 27% in 2050. I am trying to be conservative and avoid any misrepresentation. Equally, the 30% estimate is not exact - just a guide to what might realistically be achieved with substantial efforts. The take-away is always the same: decarbonisation of the global electricity supply is of necessity a holistic process as no one technology can do it alone. Greig, you need to read this, as you are having difficulty understanding the Australian electricity market. You wrote "Lots of wishful thinking and rationalising to reach a preconceived conclusion including conspiracy theories and mischaracterising the opposing view", and that is exactly what YOU have done, and continue to do in spades. The general population of Australia purchases their electricity from the dozen or so electricity retailers, not directly from the highly variable wholesale spot market. Whatever prices changes occurs at that level is moot, be it demand related or because of a change in the technology mix It is changes to the retail price that is important, the price that every Australian has to pay. The report that you quoted projected the retail price would rise by a maximum of 8.5c/kWh, which is a fraction of the 29c/kWh that we a paying now. The report actually showed that a move to renewables would NOT be expensive, a direct contradiction to your characterisation of the report. I am not advocating any particular energy source, but when I see misrepresentation because of ideology, I simply will not let that stand. If you are going to cite a report in support of your argument, do not misrepresent it. And when your misrepresentation is highlighted, the civil thing to do is man up, admit you were wrong, and continue with the debate. You on the other hand, will get into a tizzy, and start on a tirade of gish gallop and even further misrepresentation. You do it EVERY time. You now have a soiled reputation that is beyond help, and I really see little point in you posting here. You are a proven liar. It is changes to the retail price that is important, the price that every Australian has to pay. Actually that assumption is completely wrong, and the reason why you arrive at an invalid conclusion. Retail prices for domestic users impacts on your home's quarterly bill, and it is skewed (typically to accommodate the poor). However the cost burden is then transferred to industry and commerce or to taxpayers via subsidies, and that returns to consumers in the increased price of goods and services, and higher taxes. And that impacts on jobs, health, education and prosperity. In other words it is not the price of domestic electricity (which is only about 20% of the market) that matters, it is the overall wholesale price which matters. So whilst it may appear that your quarterly energy bill is all the matters, the reality is more complex. You can't triple the cost of energy production and then have that cost magically disappear - I hope that is not what you are arguing. I have quoted verbatim from the report to quantify that the cost renewable energy is expensive. I am not lying, you are simply failing to understand because you do not understand the subject (Dunning Kruger effect?). And it is not "gish gallop" to succinctly explain to you when you are making base error of assumption. Greig, you are doing it again. Misrepresenting the situation. You said "In other words it is not the price of domestic electricity (which is only about 20% of the market) that matters, it is the overall wholesale price which matters." You seem to equate the domestic market with the retail market. The retail market is what ALL consumers of electricity pays, from the largest corporations to you and me. The wholesale market only applies to the energy retailers. You seem to be missing that crucial difference. The domestic electricity might be 20% of the retail market as you say, but the other 80% of the retail market is small and big business. BUT THEY ALL BUY FROM THE RETAIL MARKET. Why is that so hard to understand? That is why your argument is moot. There was no projected 3x rise in the electricity retail market. It was a misrepresentation by you. Another one in a long line of misrepresentations. So Dave, speaking of misrepresentation, are you saying that the 8.5c/kWh increase in retail price applies to both domestic AND commercial retail pricing? Please reference your answer. This is important to answer clearly, because if you are arguing that, then you are arguing that we can triple the cost of energy production and then have that cost magically disappear - is that what you are arguing? "are you saying that the 8.5c/kWh increase in retail price applies to both domestic AND commercial retail pricing?" I am not saying anything. If you go to the next page from your quote you will see this table. "Table 14: Projected impact on retail prices"
Domestic, industrial and commercial users purchase electricity from the retail market, and not from the wholesale market. Are you really that stupid that you need to be spoon fed the answer. I mean, the answer was in your own recent quote!!! "The wholesale electricity price increase and the additional transmission prices would be passed on to consumers via retail prices." "industrial and commercial customers … retail cost." The report does not argue that a doubling of the wholesale cost will not disappear. It is represented in the 8.5c/kWh retail price increase that domestic, industrial and commercial users would all pay. The wholesale cost of electricity represents a fraction of the 29c/kWh retail cost for domestic users. If say industrial and commercial users get a bulk discount and only pay 15-20c/kWh, a price increase of 8.5c/kWh is still only a fraction of the price they pay, and certainly does not mean a tripling of prices. (It's simple math) Look, I did not come up with the 8.5c/kWh figure. It is in the report which you initially quoted!! If you think there are issues with these projections, then take it up with the AEMO. But really, are you so devoid of comprehension skills that you didn't already know the difference between the retail and wholesale electricity market? The end cost to consumers, that is domestic, commercial and industrial users, by the very report that you quoted, would NOT see a tripling in the cost of retail electricity, as was the main thrust of your misrepresentation, and the centrepiece of your alarmist diatribe. You might have that light bulb moment when it finally sinks in, but going by your previous behaviour, and your obvious lack of comprehension skills, I'm not holding my breath. You are still confused about cost and price. In fact the quotes I have produced from the AEMO 100% renewable report categorically show that the cost of both wholesale and retail electricity would be greater than 2-2.4 times current costs, plus the cost of distribution and other out of scope items (ie about triple). Which was my initial claim. The price is something different, I have already explained that to you why there is a difference between retail and commercial pricing, and how prices can be skewed by a multitude of external factors., though ultimately the impact of a tripling of the cost of electricity would flow through to everyone as a significant increase in the price of nearly everything (not just electricity). And that is not good. I have made my point. This discussion is at an end. For anyone following this exchange, here is the AEMO report referred to. The impact on wholesale prices and retail prices are set out in Section 5.8 Impact on wholesale prices on pages 34 and 35, including tables on page 35. The scenarios referred to are described on pages 35 to 39. To clarify, wholesale prices mainly relate to the generation and transmission costs. Retail prices include the cost of supply and distribution to the end customer. I doubt the cost of distribution would be hugely different no matter what the source of electricity, but any such differences are included in the model except where otherwise stated. No, your initial claim was this. "This report suggests renewables deployed in way that would actually reduce emissions, would cost about 3 times what we currently pay for energy"
We pay the retail price, and the report you quoted said the retail cost would rise about 8.5c/kWh, inclusive of the rise in the wholesale price. Australia pay's on average about 29c/kWh. If we were to pay 3 times the cost that we pay now, the retail price would have be about 90c/kWh. Look, the current wholesale price is about 5c/kWh, so a doubling of that would be an extra 5c/kWh. The report said that the eventual flow on price including infrastructure and profit would be 8.5c/kWh. A small increase. In fact the increase in the retail price over the last two years was about 6.5c/kWh, so a price rise of about 8.5c/kWh is NOT expensive, the complete opposite to what you asserted in your original tirade. You have been proven to misrepresent the report, but instead of accepting that you were wrong, you went on a pointless gish gallop AGAIN. This is your MO. It's the denier MO. You will shamelessly refuse to accept facts and instead deny, deny and then deny some more. Next you will probably claim that I am bulling you. Anyone can check the report and see that you misinterpreted and misrepresented it. This is not the first time either. You now have a pitiful record of misrepresentation. To be frank, most of us have seen this sort of abhorrent behaviour before, it's the hallmark of the denier troll. I wouldn't expect anything less of you. The fact that you have done this now on multiple threads has only reinforced everyones pitiful view of you. Heck, you even have an entire thread devoted to this behaviour after you gish galloped the Maurice Newman thread to death. The only point that you have ever made is your glaring obsession to try and force your corrupt ideology. Make that sixteen and thirty six years from now - and, ahem, not so many interestings. If anyone has trouble envisaging why there is not a direct relationship between the cost of electricity at the point it enters the grid, and the cost of electricity as it comes into the home and business - there are some similarities with other products, such as milk. The farm gate price of milk is around 40c/litre. The retail price of milk is around $1.40. The difference goes into processing, transport (similar to electricity distribution), retail/merchandising costs (similar to billing and servicing electricity customers), and profit to the various parties in the value chain. The cost of milk fluctuates most post-farm gate. Dairy farmers are price takers not price makers. On the other hand, the wholesale price of electricity is very dependent on supply/demand. On a stinking hot day in the middle of the week in summer, some electricity suppliers will even limit supply through rationing or price incentives (lifting cost to consumers) rather than pay highly inflated prices. Another reason you can't calculate TCR from 20th century data is that there aren't good numbers on anthropogenic aerosol emissions, which cause cooling. Yup. Lost count of the number of times I've had to say this. That is why I now put scare quotes around "observational" data. That and the large uncertainties over early instrumental records for surface temp and the huge effect that transient variability in ocean mixing has on upper ocean OHC. And anyway, you can't estimate ECS reliably from a short sample of "observational" data because we don't know how non-linear feedbacks will impact equilibrium. Although the oddly warm periods during the mid-Pliocene provide a troubling hint. So I'm happy to apply scientific objectivity to Lewis13 and discount the result. Ditto for Otto et al. and all the other lowball estimates of TCR and ECS based on "observational" guesswork. Subjectively I hope the recent fad for uninformative estimates of S based on "observational" data has run its course. Shub's post: crude but empty attempt to delegitimise another commenter. Still, when you have absolutely nothing else, I suppose you must make do. but empty attempt to delegitimise another commenter. Perhaps you should go back and read the comment in question again, Greig. Pointing out error is not the same as a substance-free attempt at delegitimisation. It's the difference between commenting in good faith and its opposite.